"it certainly has the features and performance chops to back it up"
"Sonically is where the Soundscape truly shines, however, keeping the often difficult-to-understand dialog from the opening ocean battle scene of Master and Commander centered and intelligible, while still producing the distant wind and atmospheric ocean sounds, giving nice width to the sonic image. Equally impressive was how the bar handled the deep bass and bombast of the cannon battle, producing rumblings I could feel and pushing the sounds of exploding cannon balls and splintering hulls well beyond the width of the bar." "The Soundscape demonstrated its ability to deliver weight and depth in reproducing the weighty voice and foot stomps of Smaug from The Hobbit: The Desolation of Smaug. It was amazing how the bar made Smaug’s voice boom and rumble around the room, seeming to come from nearly everywhere at once, producing a very real faux-surround effect." 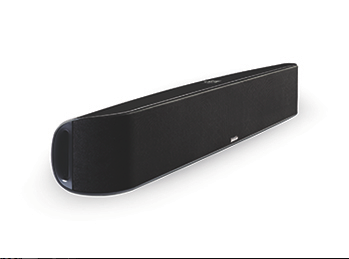 "While the Soundscape is pricey by soundbar standards, it certainly has the features and performance chops to back it up. And when clients hear how great it sounds without requiring an extra black box, they’ll likely consider it a bargain." Click here! to read the full review from Residential Systems. Click here! for more info. on the Paradigm Soundscape.